Centro di Sulmona: 3 camere da letto, 2 bagni, aria condizionata, WiFi e terrazza. Tre camere da letto, due bagni appartamento sulla parte superiore della casa con ampio terrazzo e due balconi. Aria condizionata e WiFi ad alta velocità. L'appartamento si trova al 3 ° piano. Nessun ascensore. Questa splendida conversione di un convento del XVI secolo si trova nel centro storico di Sulmona. L'ampia terrazza è il gioiello di questo splendido appartamento. Senza alcun accenno di esagerazione le viste da qui sono semplicemente mozzafiato. Goderai serate magiche con vista sulle splendide montagne del Parco Nazionale della Majella e sui tetti del centro storico di Sulmona. Questo appartamento è stato arredato con mobili moderni. La cucina moderna e la sala da pranzo (grande tavolo e sei sedie) sono convenientemente amate sulla terrazza dove abbiamo anche un grande tavolo con 6 sedie, un tavolino da caffè e una seconda area salotto per rilassarsi in questo meraviglioso spazio. Ci sono tre camere da letto in questo appartamento. Al piano superiore c'è una camera matrimoniale con bagno privato (aria condizionata). Nel piano inferiore di questo duplex, ci sono due camere da letto (una con aria condizionata) che condividono un bagno. Un bellissimo soggiorno climatizzato con balcone e zona studio completano questa splendida penisola. Due bagni Un bagno è privato l'altro bagno si trova accanto alle altre due camere da letto. Entrambi i bagni hanno wc, bidet e ampia doccia. 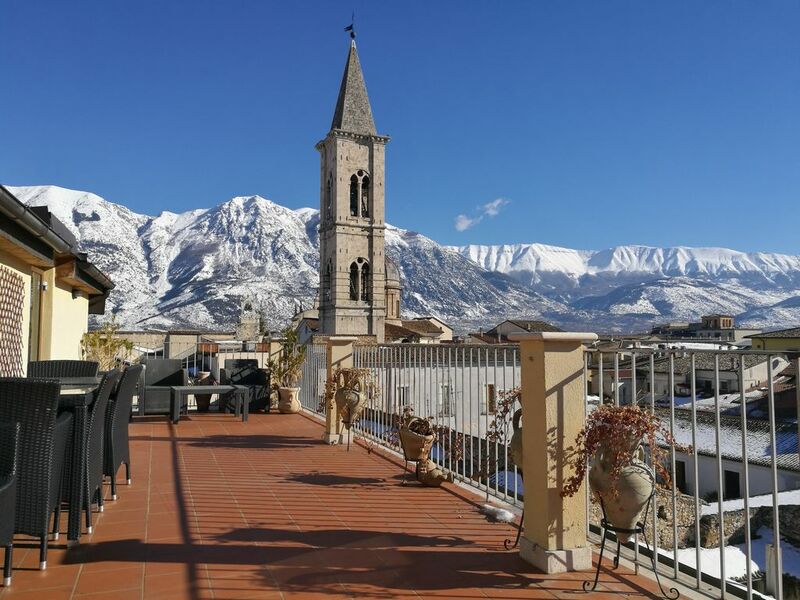 The PERFECT stay in Sulmona! My family and I were so glad to meet Victor upon arrival at the apartment. We really appreciated his passion for Sulmona, and he was willing to help us in any way needed during our stay. The apartment (as noted in the description & other reviews) is 50-60 steps up, but we would not have changed it for the world. Each room had an incredible view of the city, mountains, & sky. The view from the balcony was breathtaking, almost too good to be true. Thank you Victor for opening up your home to us, we will be back! We spent two weeks in Sulmona and loved it. The Legacy villa is centrally located, so is very close to many shops, cafes, restaurants, the main piazza, churches, parks, groceries, the bus station, and is just a few steps away from the Annunziata and the tourist information office. It is a bit of a walk from the train station, so if you have luggage I would recommend taking some other form of transportation to get to the villa. We rented the top floor apartment with the large balcony, which has an incredible view of the town and surrounding mountains. Such a lovely place to relax and enjoy the scenery and sounds of the church bells. The villa is attractively decorated and spacious - plenty of room for our group (five adults and a baby). The stairs are a bit tricky, but part of the adventure - good exercise! (and we had to block them off for the baby, but it worked out fine.) Our host, Victor, was welcoming and had helpful suggestions and information about the area. Sulmona is close to many gorgeous, tiny mountain villages and Abruzzo is a beautiful area to explore. We would recommend day trips to Barrea, Scanno, Pacentro, Roccoscalegna Castle, and Borrello - the Shangri La Ristorante there served a spectacular lunch. An hour by train takes you to the city of Pescara on the Adriatic Sea, with beautiful beaches - in May it was practically empty, even though the weather was great. The Pelino Confetti factory/museum (free) was interesting. On Wednesday and Saturday mornings there is a large market in the main piazza - all the local people go to shop, and you can find all sorts of fresh produce, cheeses, salamis, etc. Welcome to Sulmona offers a fun half-day adventure of walking through the market, then helping to make a delicious lunch at the Hotel Ristorante Ovidius kitchen. Homemade pastas, soup, sauces, etc. with two personable ladies who tell stories and sing! Orso s.n.c. di Alessandro Dionisio e C. is a very helpful and friendly car rental company in Sulmona. We just returned from spending 1 week in The Legacy House in Sulmona. We stayed in the top floor apartment with 3 bedrooms and 2 bathrooms. We enjoyed our stay very much in spite of the heat. The unit has 3 air conditioners but soon found out that we could not use all 3 at the same time, or if you wanted to use the washer or any other item which used electricity it would be best to only have 1 of the units on or risk blowing a fuse, which we did the 1st night. But Victor was wonderful and remedied the problem fast. There were 5 of us (all adults) in the 3 bedroom unit on the 3rd floor which has about 60 steps so if you have problems with going up and down many steps then I do not recommend this. We found it a little tuff the 1st couple of days but after going up and down a few times we got used to it and looked at it as exercise to work off all the good food you eat while staying here. The view from the terrace is well worth all the steps to make it up there. The unit itself is very modern and well equipped and spacious. Sulmona is a wonderful city that never sleeps, maybe because it was August and most are on holidays, but the main square was very much alive at 1am though most café and restaurants close between 12am and 1am. We found a great restaurant we would recommend called "Don Ciccio", the food is excellent and very reasonably priced. The best cappuccinos are from the "Café Dividio" and their pasteries etc are very tasty. And if you are staying or visiting Sulmona be sure to pick up some of the confetti which Sulmona is famous for and originated from here. They have all flavours now and have some beautifully made up into flowers etc, great little momentos and/or gifts. Oh and if you rent a call there is free parking not far which Victor advised us of but again be prepared for a short walk which includes a very steep hill with about 50 steps. All in all we all enjoyed our stay and definitely recommend this property. Upon our arrival we were told that the apartment we had booked was not available. No explanation was given. We were given two small rooms for the five of us, one of which was quite warm, had not a/c and one window that opened only a crack. The next day we did move to the apartment we had booked. Because of the inconvenience , the owner deducted 50 euros from the final cost. The apartment was clean and well appointed. Although it was advertised as having three room air conditioners, we were told that we could only use two at a time otherwise we would blow the breaker. As it turned out this was not a problem for us. The day after our arrival the owner left the country and told us that there would be a local person in case something came up. I asked for this person's email or mobile number but we never received it. The staircase to this unit is up a final windy set of stairs. If a person has any mobility issues, I would not recommend renting this space. This unit is a also a duplex and the interior Spanish-style staircase is also quite windy and an older person or again someone with mobility issues might have real difficulty. We were planning a trip to Abruzzo and decided on Sulmona because the photos on the website made this unit look pretty fantastic. It is pretty fantastic. It was our daughter's favorite of the three places we stayed in Italy. This unit is a two-floor unit with a large living room, two bedrooms, office, reading nook, bathroom and two small balconies on one floor, with a third bedroom, bathroom, kitchen and large terrace on the second floor. The terrace was particularly nice. The building is one or two stories higher than most of the buildings in the old part of town, so you can look over the entire city, and are very close to the main church's tower, with mountains in the background. The WiFi was sufficient for email and internet searches, but the connection was not strong enough to download sizable attachments. When we arrived, we were told that for the first night of our stay we could not have the unit we had booked and paid a 30% deposit for. We spent the first night in the 2d floor unit and then moved up the next day. The owner was good about it and gave us a discount as a result, but this is the main reason for four rather than five stars.